Anterior STEMI results from occlusion of the left anterior descending artery (LAD). Anterior myocardial infarction carries the worst prognosis of all infarct locations, mostly due to larger infarct size. A study comparing outcomes from anterior and inferior infarctions (STEMI + NSTEMI) found that on average, patients with anterior MI had higher incidences of in-hospital mortality (11.9 vs 2.8%), total mortality (27 vs 11%), heart failure (41 vs 15%) and significant ventricular ectopic activity (70 vs 59%) and a lower ejection fraction on admission (38 vs 55%) compared to patients with inferior MI. In addition to anterior STEMI, other high-risk presentations of anterior ischaemia include left main coronary artery (LMCA) occlusion, Wellens syndrome and De Winter T waves. ST segment elevation with Q wave formation in the precordial leads (V1-6) ± the high lateral leads (I and aVL). Reciprocal ST depression in the inferior leads (mainly III and aVF). NB. The magnitude of the reciprocal change in the inferior leads is determined by the magnitude of the ST elevation in I and aVL (as these leads are electrically opposite to III and aVF), hence may be minimal or absent in anterior STEMIs that do not involve the high lateral leads. The nomenclature of anterior infarction can be confusing, with multiple different terms used for the various infarction patterns. The following is a simplified approach to naming the different types of anterior MI. Anterior-inferior STEMI due to occlusion of a “wraparound” LAD simultaneous ST elevation in the precordial and inferior leads due to occlusion of a variant (“type III”) LAD that wraps around the cardiac apex to supply both the anterior and inferior walls of the left ventricle. De Winter T waves: upsloping ST depression with symmetrically peaked T waves in the precordial leads; a “STEMI equivalent” indicating acute LAD occlusion. ST elevation is maximal in the anteroseptal leads (V1-4). Q waves are present in the septal leads (V1-2). There is also some subtle STE in I, aVL and V5, with reciprocal ST depression in lead III. 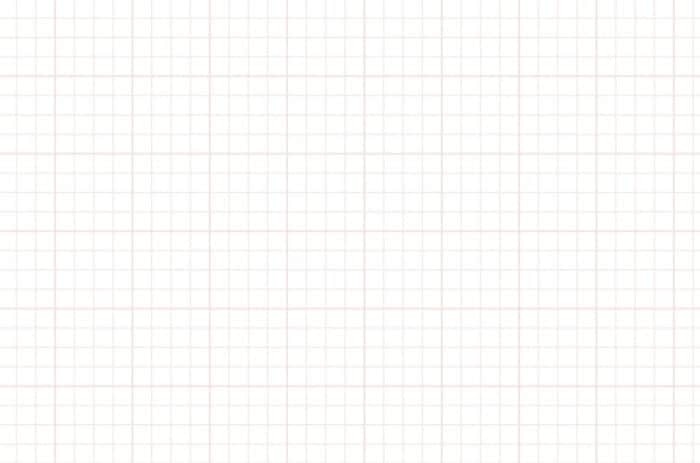 There are hyperacute (peaked ) T waves in V2-4. There are hyperacute T-waves in V2-6 (most marked in V2 and V3) with loss of R wave height. The rhythm is sinus with 1st degree AV block. There are premature atrial complexes (beat 4 on the rhythm strip) and multifocal ventricular ectopy (PVCs of two different types), indicating an “irritable” myocardium at risk of ventricular fibrillation. ST elevation is now also present in I and aVL. There is some reciprocal ST depression in lead III. 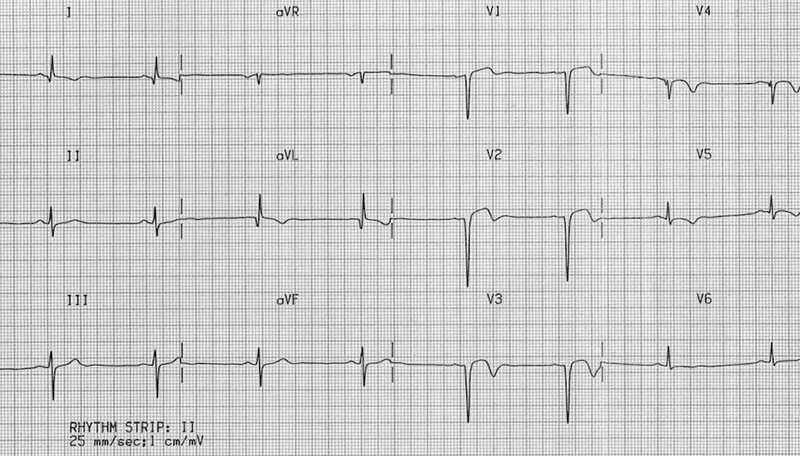 This is an acute anterior STEMI – this patient needs urgent reperfusion! ST elevation in V2-6, I and aVL. Reciprocal ST depression in III and AVF. ST elevation in V1-6 plus I and aVL (most marked in V2-4). Minimal reciprocal ST depression in III and aVF. Q waves in V1-2, reduced R wave height (a Q-wave equivalent) in V3-4. 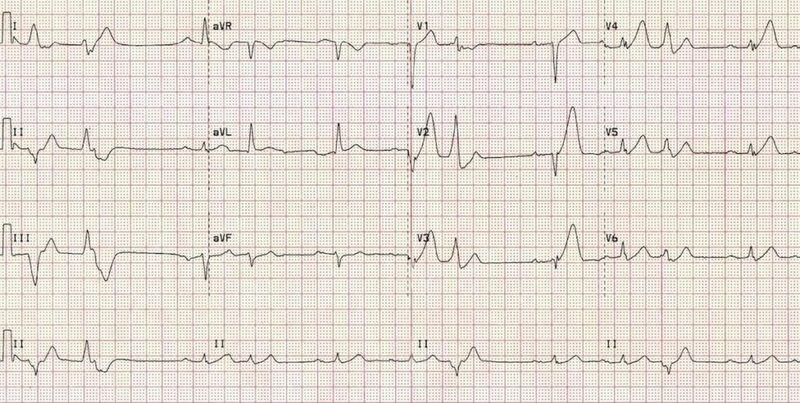 There is a premature ventricular complex (PVC) with “R on T’ phenomenon at the end of the ECG; this puts the patient at risk for malignant ventricular arrhythmias. Deep Q waves in V1-3 with markedly reduced R wave height in V4. Residual ST elevation in V1-3 (“left ventricular aneurysm” morphology). Biphasic/inverted T waves in V1-5. Poor R wave progression (R wave height < 3mm in V3). Abnormal Q waves and T-wave inversion in I and aVL. The pattern indicates prior infarction of the anteroseptal and lateral walls. Massive ST elevation with “tombstone” morphology is present throughout the precordial (V1-6) and high lateral leads (I, aVL). This pattern is seen in proximal LAD occlusion and indicates a large territory infarction with a poor LV ejection fraction and high likelihood of cardiogenic shock and death. ST elevation is present throughout the precordial and inferior leads. 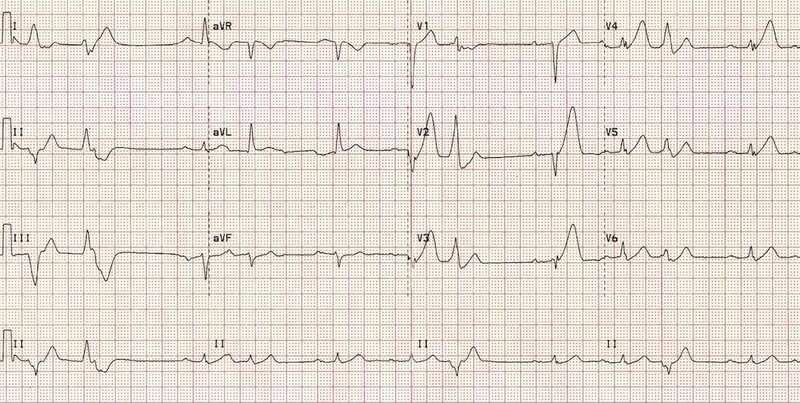 There are hyperacute T waves, most prominent in V1-3. Q waves are forming in V1-3, as well as leads III and aVF. The site of LAD occlusion (proximal versus distal) predicts both infarct size and prognosis. Proximal LAD / LMCA occlusion has a significantly worse prognosis due to larger infarct size and more severe haemodynamic disturbance. 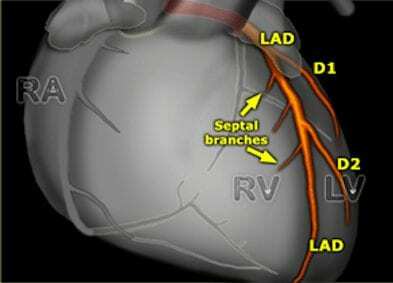 The site of occlusion can be inferred from the pattern of ST changes in leads corresponding to the two most proximal branches of the LAD: the first septal branch (S1) and the first diagonal branch (D1). D1 supplies the high lateral region of the heart (leads I and aVL). ST elevation in aVR of any magnitude is 43% sensitive and 95% specific for LAD occlusion proximal to S1. Right bundle branch block in anterior MI is an independent marker of poor prognosis; this is due to the extensive myocardial damage involved rather than the conduction disorder itself. There is a septal STEMI with ST elevation maximal in V1-2 (extending out to V3). There is a new RBBB with marked ST elevation (> 2.5 mm) in V1 plus STE in aVR — these features suggest occlusion proximal to S1. This patient came in post VF arrest and was taken straight to the cath lab where he was found to have a complete ostial occlusion of his LAD. > 1 mm ST depression in the inferior leads. Bayés de Luna A, et al. International Society for Holter and Noninvasive Electrocardiography. 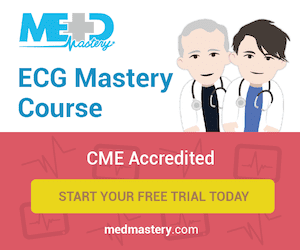 A new terminology for left ventricular walls and location of myocardial infarcts that present Q wave based on the standard of cardiac magnetic resonance imaging: a statement for healthcare professionals from a committee appointed by the International Society for Holter and Noninvasive Electrocardiography. Circulation. 2006 Oct 17;114(16):1755-60.